It's extremely important that your boiler system maintained, adjusted, and inspected annually to ensure optimum performance, efficiency and safety. An annual inspection allows a technician to identify and address issues before they cause more damage to your system. 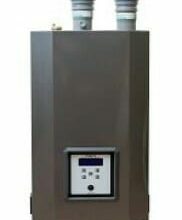 High Efficiency Boilers, and Hydronic systems are expensive to install but highly efficient if installed and maintained properly. We offer annual maintenance service for a wide range of hydronic systems including indirect water heaters and in-floor heating. Code requirements and new updates are considered during boiler inspection. Sensors are checked and cleaned, if required. Gas pressures are checked and adjusted if necessary. Glycol in-floor heating freeze points are measured and adjusted (if applicable). Boiler burner chamber is inspected and cleaned (or flushed) as needed. Controls (thermostat), safety’s, auxiliary controls, wiring and connections are all checked. Amperage draws and performance of electrical parts are tested to ensure proper performance. A Combustion Efficiency test is taken and printed, adjustments are made to insure proper manufacturer set points. A Carbon Monoxide (CO) test is also conducted to ensure the fuel is burning safely within your home. All curculators are checked and lubricated if applicable. General water piping, pressures, and expansion is checked and adjusted if required. A ph test is done to determine water qualities within system. When completed, we’ll give you a comprehensive written report of the details of the service. The technician will make any recommendations at this time, and answer questions about your system. Looking for a quote on a new boiler system, upgrade or indirect comby add-on? Complete and submit the form below and I’ll get in touch to set up and appointment to look your current system, review your options and provide a quote for a new system or upgrade.